We are in a way wired into a psychology of doing something all the time which we like to interpret as being active. I say this out of experience I was away to a small tucked away scenic and sparsely populated province in France with a on a NLP course. All one could see was the rolling hills and beautiful marigold fields. We had a daylong session and were to meet now only at dinner. I was overjoyed to have some time to myself. Once I was back to my room; I figured had already done my regular calls back home and checked my mails. Wow! Now my mind reeled out many options – I could possibly walk to a friend’s room and discuss the next day’s plan; or maybe I could read a book; or maybe chat with the locals as it was really a rare chance to be there. Somehow my body was not ready to action any of it and my mind got impatient with each passing moment – for it considered this a precious waste of time. What seemed like a pleasant restful time by myself, now became an inner chatter of sorts. And then something came over me and I changed into my sports gear and a comfy pair of walking shoes and I just set out on a walk not really planning but just going along. It felt uncomfortable to go without a plan and thoughts were hammering one after the other – till when I began to savour the wind in my face, feel the path beneath my feet, saw the beauty of the blue skies, the rolling hills and the tall green grass. I felt at ease. And then I felt a tap on my shoulder – there were my friends from the NLP course – An Iranian, Italian and British. We exchanged glances and smiled and just went on for a walk. Not knowing what was on each one’s mind but just trusting and walking along. Our stories began to flow and we shared effortlessly without a plan. The beauty around was pronounced but not where we were and to top it, we had to slide of a narrow path littered with tiny stones and mud to get onto another connecting road. We didn’t even realise when we got onto the road as one slid after the other with the help of one another. There we were facing a shredded spot of almost dry trees and shrubs. 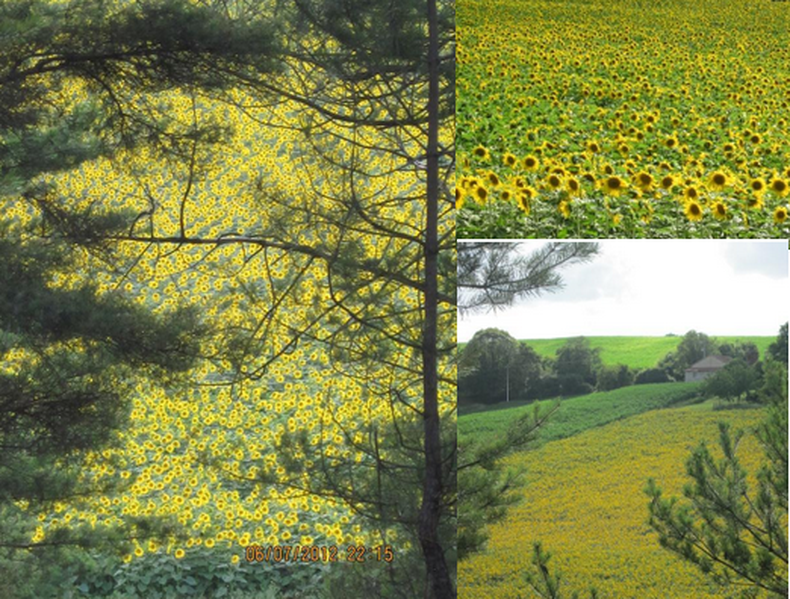 But lo behold what peeked through those trees is probably one of the most enchanting sights of a lifetime – a field filled with yellow bright happy sunflowers – so mesmerising in the way they swayed as though waving out to us in glee . We all shared that special moment of striking the pot of yellow gold at the end of the rainbow. When I reflect and relive that moment; I recall the inner chatter was replaced with the inner calm and joyous state. It was a state of not knowing the flow but just trusting the unwinding road of life that will when shared with your near and dear ones lead you to your shining bright sunflower postcard God carved for you! Maybe in the hustle and bustle of living life; we miss out on life. When life knocks us with its mundane and routine; all we need to do water your plants, take a walk, play with that cute dog, give a hug to someone you luv, sing a song, make someone’s day and best of all simply just be! Like my Italian friend said – Dolce far niente i.e. sweetness of doing nothing. Try it for it has the power to find the authentic you and spring you back with more even more life! Keep your face to the sun and you cannot see the shadow.